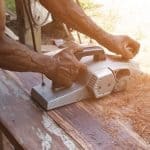 The magnetic drill is a versatile tool. Fabricators and contractors can choose from several types and sizes these days. Add that to the array of annular cutters available and the various features that manufactures pack into their drills and you are left with an overwhelming choice. Which raises the question; which is the best magnetic drill press on the market today? Well we have attempted to answer that in this top 5 review round up. For our findings at a glance, simply head to our results table below. For a dedicated buyer’s guide, plus full reviews of each of our top selected drills, keep on reading. There is a wide range of mag drills available. There’s your basic portable magnetic drill, the larger more powerful mag drill press. 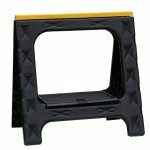 There’s also low profile options that help you work in otherwise hard to reach areas. Power options vary, as does the features you can expect to find. There’s also the issue of brand quality and expertise. 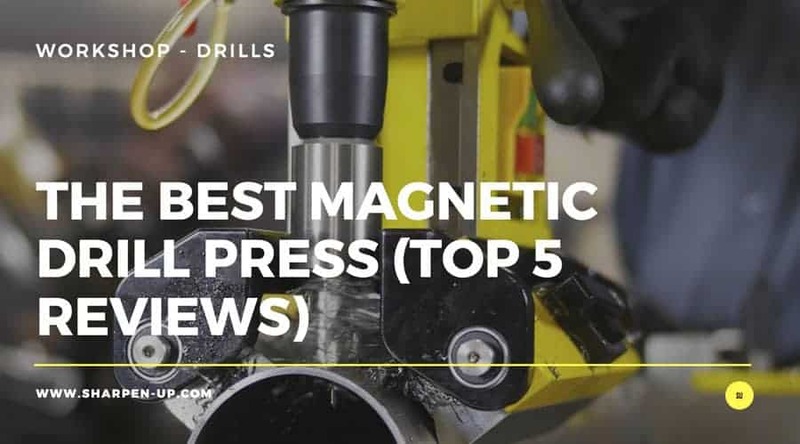 Before we jump into that however, let’s take a look at the different types of magnetic drill press and the benefits of each. A popular type of magnetic drill is the portable manual-feed option, often paired with annular cutters or twist drill bits. They come in a variety of sizes, speeds and HP. Some will also have in built coolant options depending on the depth of cutting they are designed for. The majority of this type of mag drill will feature a three-handle feed with a slide and gib system. 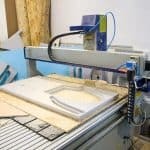 This allows for the motor, arbor, and cutter to move together as you work. Another option available to you when buying a magnetic drill is the variable-speed, quill-feed model. These have a large drilling capacity and the design means gib and slide adjustments are not required. 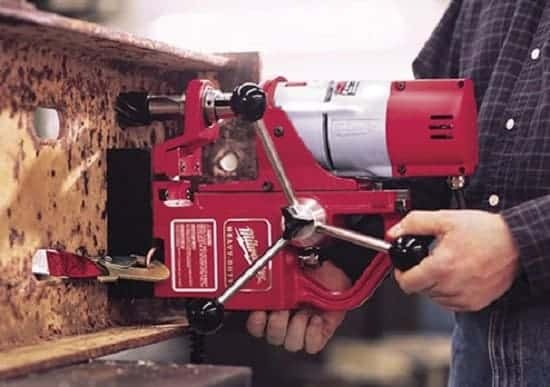 Because the drill utilises a fixed profile, it means you can manoeuvre the tool into confined spaces that are just not possible with a standard magnetic drill press. The quill feed is a great feature that allows for fast and smooth results. This is maintained throughout the cut and is especially useful for consistency during deep drilling. Again, pressurized coolant delivery systems can work in conjunction with these tools. The variable speed feature is also important for versatility as well as extended durability, which can increase tool life over the long term. Another good solution if you plan on drilling in ultra confined areas is the low profile magnetic drill. Generally classed as mini drills the tools operate with a single feed handle as opposed to the 3 handled functionality you will find on the larger portable presses. To be able to drill in such tight conditions the system uses a quill feed. This basically means that the size of the actual tool is the only limitation on where you can work. Low profile magnetic drills are also lightweight, making them a versatile solution if you are working up a ladder, or are forced to carry the tool from place to place. 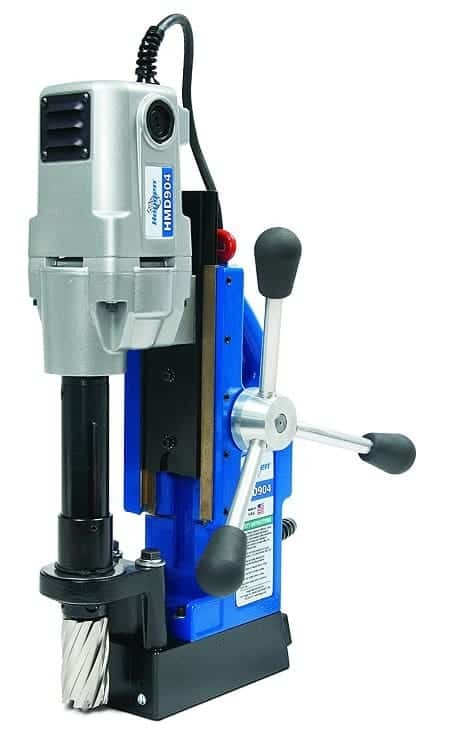 Swivel base drills take the magnetic drill press to another level of versatility. The swivel base allows the operator to drill in both vertical and horizontal positions. Furthermore, the swivel-base drill is designed in a way so that you position the drill and then activate the magnet. This makes precision alignment possible due to the fact you swivel the drill in to position over the hole’s centerpoint before you lock down. As with any good power tool, there’s a wide range of brands manufacturing their own take on the product in question. The magnetic drill is no different. Let’s take a look at a few brands you should look out for when in the market for buying your next mag drill. As we have covered, mag drills vary greatly in their size, weight and overall functionality such as power and depth of cut. Quite simply, the more expensive offerings from Hougen will provide higher specs than those tools that form part of their budget lines. 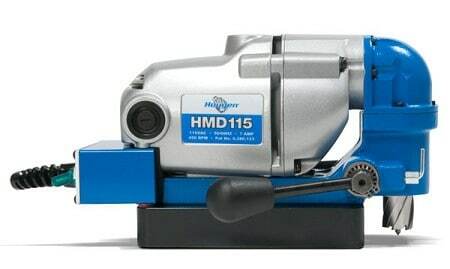 If you are looking for extremely low profile mag drills, we highly recommend the Hougen HMD115 and HMD150. 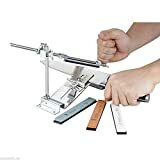 The fact these tools can really get in the nooks and crannies has made them a very popular choice with mechanics and other workers whose environment is space restricted. One of the company’s most popular mag drills and a great all rounder overall (it came in a close second in our review roundup), is the Hougen HMD 904. At the top end for those looking for something more heavy duty Hougen can once again deliver. The Hougen HMD925 has built in Powerfeed and you might be interested in the HMD505. The specs here include a d.o.c. of 3” 2 selectable RPM speed settings. Overall one of the best brands available when it comes to quality magnetic drills. DeWalt are a brand that need little introduction. There’s hardly a power tool category around that this company doesn’t have a product line. Mag drills are no different. 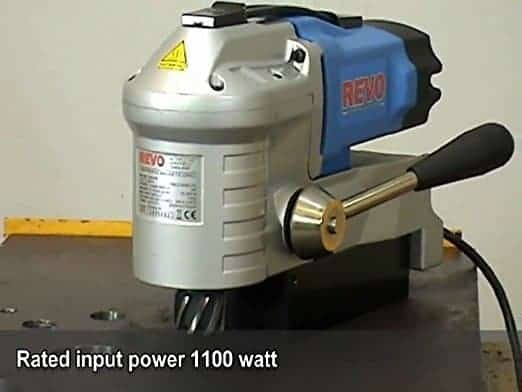 And while the company doesn’t have a long line of tools when it comes to the various types of magnetic drill presses available, the main one they have released has proven very popular, and did in fact get our top pick in this review round up. It is of course the DWE1622K, (fully reviewed below). Dewalt are consistent with their output across all types of power tools. Along with the competitive 3 year warranty they provide on the majority of their products, it makes this one manufacturer always worthy of your consideration when looking to purchase a new ‘toy’. The other serious brand when it comes to mag drills is Milwaukee. They provide the market with quality machines in the larger range of 57-72 lbs. Of course this does make them less portable than the offerings from the likes of Hougen, but what they lack in manoeuvrability, they often make up for in sheer features and performance. Another benefit with Milwaukee drills is that many of the m feature keyed chucks that are compatible with regular drill bits. Hole saws or the Milwaukee Steel Hawg Cutters (up to 6”) can also be used with this versatile system. Definitely a brand to look out for when in the hunt for a new magnetic drill press. 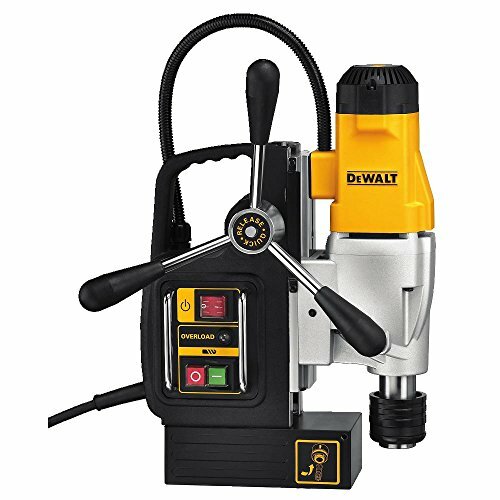 Our number choice Magnetic Drill Press goes to the DEWALT DWE1622K. Now this may seem like a bit of a curveball when you factor in we have also reviewed some bestselling drills from both Hougen and Milwaukee here. However the Dewalt just pips because of its balance of affordability and great features. First off the 10 amp motor comes with 2-speed settings. That’s premium functionality right there. Furthermore the engineers over at Dewalt have added overload protection electronics. These cut off systems help prevent motor damage and undue strain on relevant components. The end result? Your tool will last longer. The drill is also fitted with a quick change chuck system. This enables the user to change between a 3/4″ Weldon Shank and 1/2″ keyed chuck all via a tool-less interface. Work speed efficiency is further increased due to the quick release feed handles. These also function without the need for extra tools, meaning you can swap the handles each side of the drill with ease. It doesn’t stop there with regards to the features. The Dewalt DWE1622K even has a magnetic self feed cooling tank. This allows for heavy duty application and can also be placed in various orientations around the drill depending on how you are using the tool. 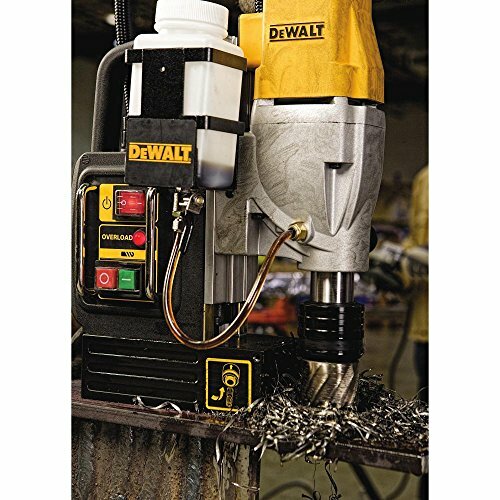 Download the DEWALT DWE1622K 2-Speed Magnetic Drill Press manual. A single user has complained about the quick release chuck system not being up to the job. The DEWALT DWE1622K has all the features you could want in a top level magnetic drill. Despite the fact DeWalt do not have the same pedigree as the likes of Hougen when it comes to this category of power tool, they have taken their manufacturing prowess from other areas and brought that expertise firmly to the table here. Highly recommended. The Hougen HMD904 Portable Magnetic Drill is one of the most popular drills in this particular class; it easy to see why. Okay, you will be reaching a bit deeper into your pocket when compared to our top pick Dewalt, however for those that need that power and functionality that the HMD904 offers, they will not be disappointed. As the drill of choice for fabrication what you have here is a lightweight and versatile drill that has been designed with the professional in mind. Hougen have recently given the HMD904 an overhaul and added a new two stage magnet. This has been manufactured in a way that increases magnet life by only reaching full power when the motor is actually turned on. The tool also features a new housing and slot drive arbor system. Other refined features include the positive slug ejection, and a built in pilot light that provides illumination in low light working conditions. The quick change feed handles can be swapped from each side of the machine with ease. There is also a rather nifty lift detector safety system to prevent accidental operation, as well as rear mounted controls. Another benefit of buying a Hougen drill press is the fact you open yourself to the wide range of quality accessories that the company manufactures. Everything from drill chucks, tapping, countersink tools and a whole lot more are fully compatible with the Hougen HMD904. Net Weight – 27.5 pounds. There is very little to complain about here. The Hougen was a very close contender for our number one pick. The Hougen HMD904 115-Volt Magnetic Drill is formidable tool. 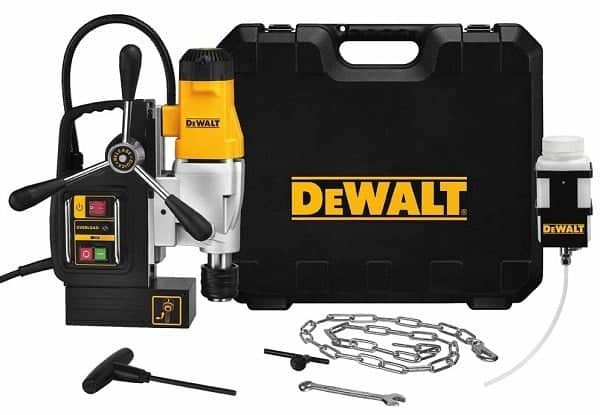 As far as power and functionality it comfortably matches our top pick Dewalt. Fans of the Hougen brand will not be disappointed. Now we come to another of the heavy weight manufacturers in the magnetic drill space: Milwaukee. In fact, the brand is well known for a wide range of premium power tools designed for both professionals and home users alike. 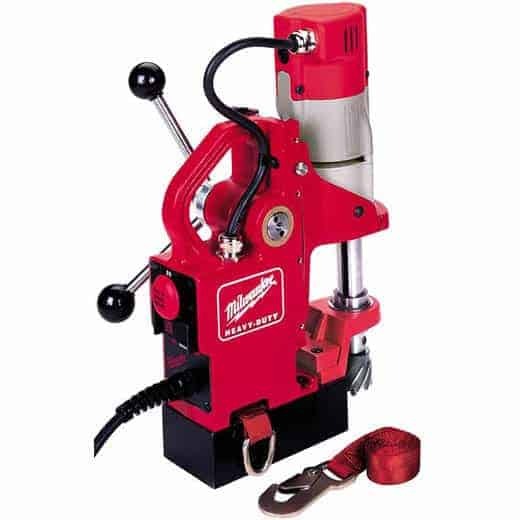 With the Milwaukee 4270-21 9 Amp Mag Drill you are getting a light weight press (weighing in at 26-1/2 pounds) designed for portability. 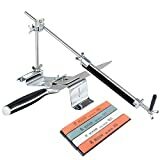 The tool is well balanced and features a comfortable carrying handle and is actually designed to keep the cutter wrenches stored on-board. The real benefit here however is the fact Milwaukee have not traded power for this increased portability. The 4270 stacks a rather pleasing 1.1 maximum horsepower, 9.0 amp motor under the hood. Drill depth and capacity is good too. 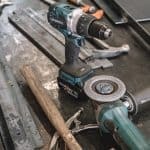 The Milwaukee can drill up to 1-1/2-inch diameter holes with ease (using annular cutters you can expect to make your way through 2-inch thick steel). 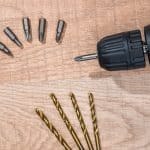 Connect up the twist drill bits and the tool still has the capability and power to drill 1/2-inch diameter holes up to 4-1/4-inches deep. 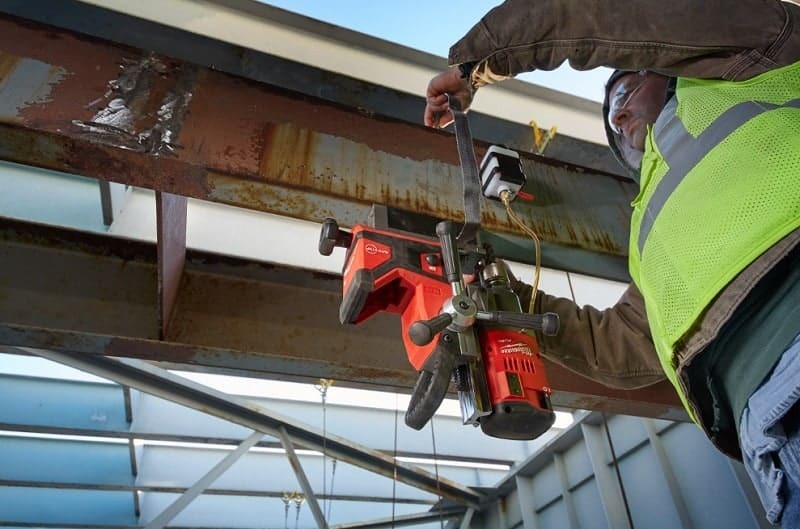 Compatibility is not an issue; the Milwaukee 4270 accepts standard 3/4-inch Weldon shank cutters, while a 3-jaw chuck is available when you need to connect up twist drill bits. Let’s not forget the quality of the magnet either. Here Milwaukee have opted for a strong two-coil magnet. Performance level is high with a maximum 2,300 lbs. of deadlift force when used on 1-inch thick steel. A tool-less feed handle forms part of the design of course; this can be conveniently swapped from side to side of the unit when required. The control panel is also conveniently placed at the back of the tool, and incorporates an easy to use two button interface. 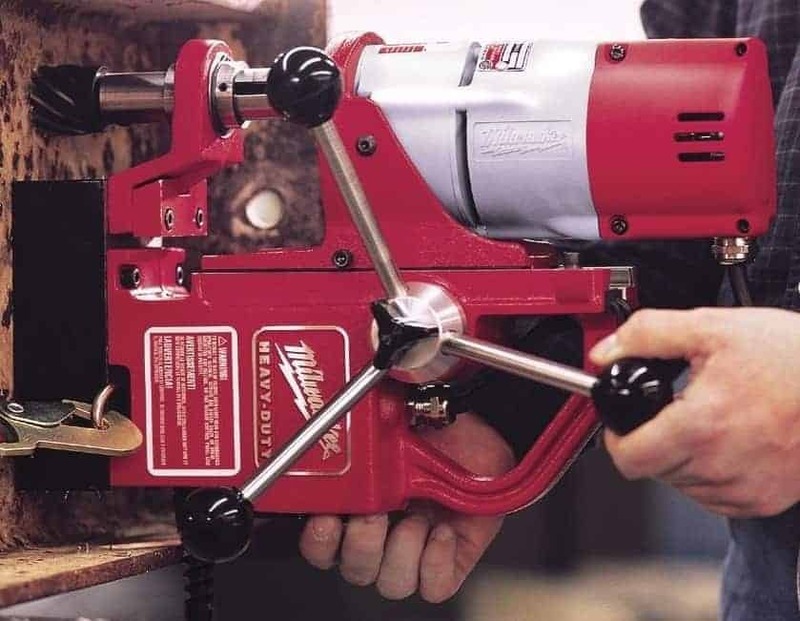 The power does not sacrifice portability – the light weight tool comes in at only 26 ½ lbs. The Milwaukee is the most expensive drill in our top 5 round up. 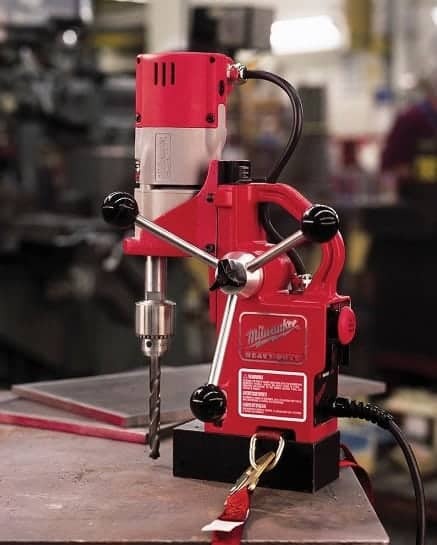 The ever reliable Milwaukee do not disappoint with the 4270 magnetic drill press. Portability and power combined and with features that will appeal to both the professional and home tradesman. Highly recommended. Now its time to look at one of the best low profile magnetic drills currently available. If you need to drill into confined spaces, the low profile design is exactly what you need to go for. 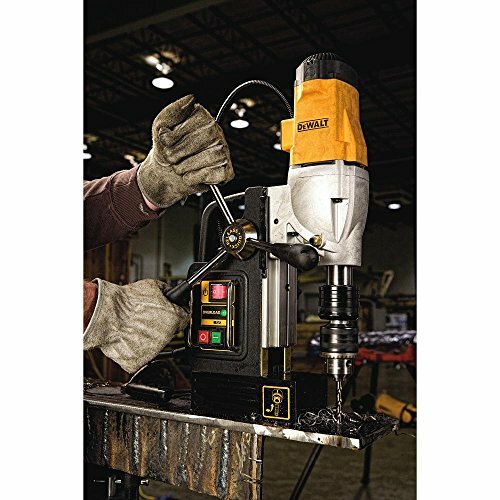 With the G&J Hall Tools REVO Low Profile 35 magnetic drill press we have a surprisingly powerful unit with a respectable cutting capacity of 1-3/8 inches. G&J Hall have included a 1100-watt motor. There magnetic adhesion unit also packs a punch coming in at 3365 lb. 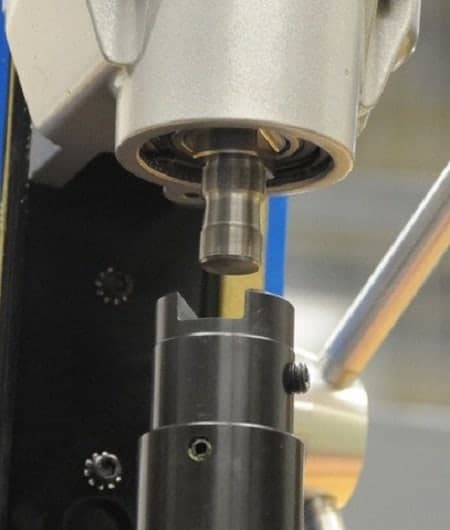 The machine features a quick-release arbor (enabling fast, efficient cutter changes), and the spindle and chuck system is compatible with twist drill bits, annular cutters, and threading taps. Portability is exactly what you would expect from a low profile mag drill. The fold-flat carrying handle is sturdy in design, there’s also a reversible stroke handle. The control panel is well positioned on the REVO low profile, and the manufacturers have even included an LED light to illuminate the work area in poor light conditions, (a very real issue in confined environments). Strong magnetic adhesion of 3365 lb. 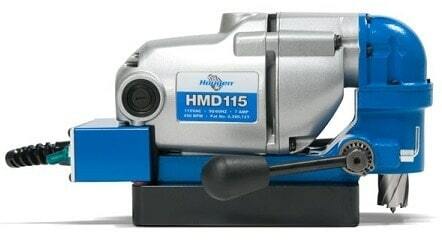 For marginally less outlay you can buy the HMD115 from Hougen, which is the better tool. 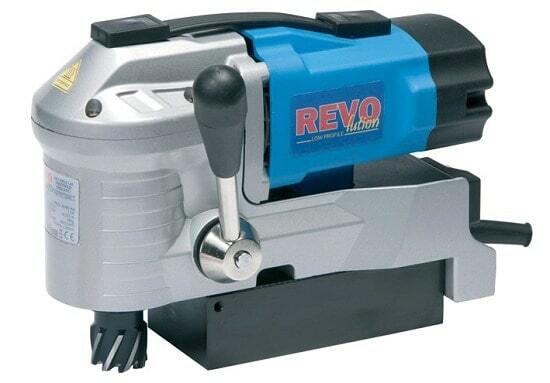 The G&J Hall Tools REVO Low Profile 35 Magnetic Drill Press is a quality low profile option. It doesn’t quite match up to the offering from Hougen, however the price, power and features that it provides make it a worthwhile option. The Hougen HMD115 Ultra Low Profile Right Angle Drill is one of the most popular low profile drills currently available on the market. 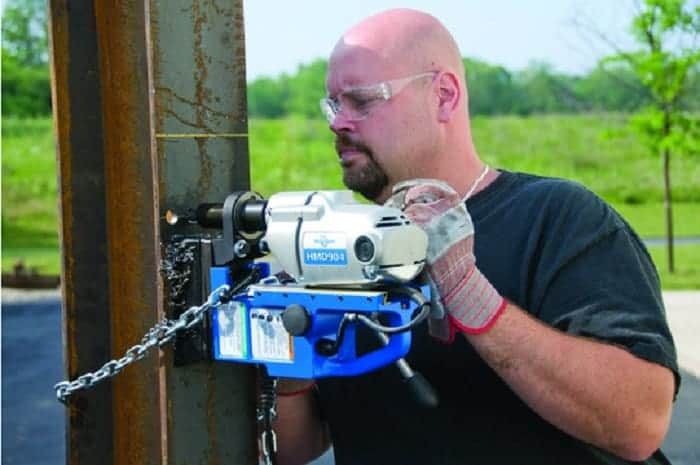 Packed with the kind of features we have come to expect from a Hougen mag drill, the HMD115 still has the dimensions you need to fit into those really hard to reach spots, (the tools stands a mere 6-11/16 inches tall). The Hougen HMD115 has been fitted with RotaLoc cutters. These robustly constructed cutters allow for tool-less installation and removal. This drill is equipped with a positive slug ejection as well as a high torque gearing system. Motor overload and the words Hougen do not go together at all. The HMD115 also features a patented quill feed arbour. The performance level is great here, with smooth cuts and minimal maintenance being a major benefit. Portability is of a level you need for a right angled low profile mag drill. Carrying the HMD115 around the work place, (and holding it up to hard to reach surfaces) is a doddle; the unit weighs only 21.3 pounds. Hougen have also provided a sturdy carrying case for transporting the drill between jobs. Very little to fault here. The power and dimensions are exactly what you need from a low profile mag drill. The Hougen HMD115 is an industry leader when it comes to low profile mag drills. There others on the market that cost less, however if you want superior design and performance in your drill, this is the one to go for. Very biased review. What about premium German brands like BDS Machines and Fein?